I'm trying to open the link below but it's not loading at all. I've been waiting quite a long time, but I'm not receiving a response at all. Usually I'd have some sort of synopsis of what the issue was but to be honest…I just turned it off and back on again. status-completed, for now. I'll see if I can figure out what the cause was. There's an additional issue where the large number of candidates in this election can cause an API throttle violation due to an apparent mishandling in the code that's supposed to account for that, so if the load finishes but some of the data is missing (i.e. the recent user activity), that's the cause. I'll try to fix that as well. Not the answer you're looking for? Browse other questions tagged support election . Why am I getting docked reputation for someone else's answer? How can I limit my searches to a particular date range? 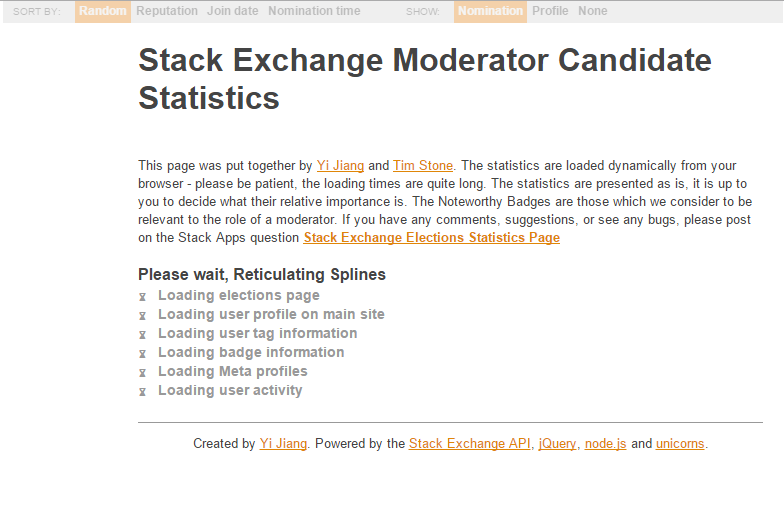 Change in Stack Overflow RSS feeds? Do Stack Overflow Teams sites support GIFs in questions and answers?